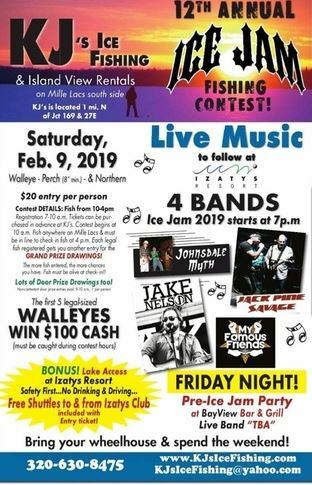 KJ’s Ice Jam Fishing Contest with cash prizes and drawings! Live bands including Johnsdale Myth, Jack Pine Savage, Jake Nelson and My Famous Friends at Izatys Resort following the weigh-in. Rent from us or bring your wheelhouse & stay the weekend!